Interested in the big technology players like Apple, Microsoft, or BlackBerry? Ever considered working for a company in an early start-up phase that could use your expertise in financial matters to help them thrive? Want to learn about how your accounting and finance education can be leveraged to make an impact in the technology sector? 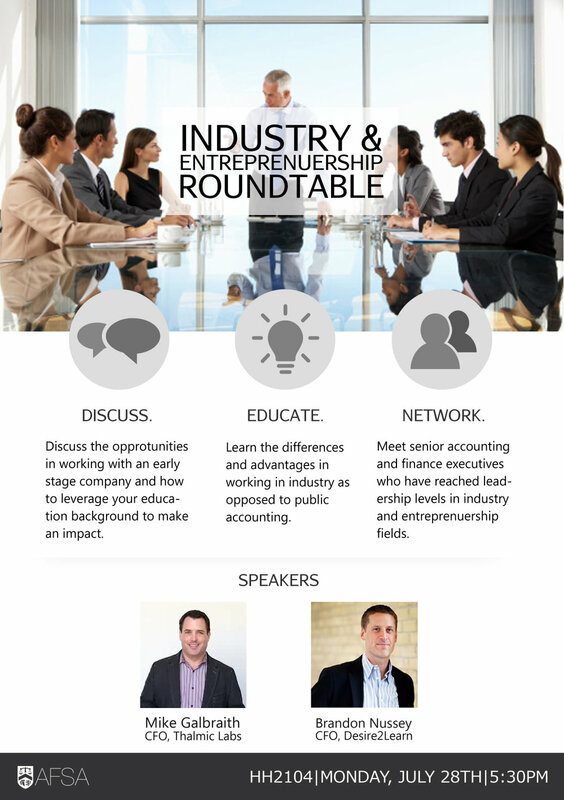 On July 28th, AFSA is hosting an Industry and Entrepreneurship roundtable in Hagey Hall (Room HH 2104) at 5:30pm. Brandon Nussey, CFO, Desire2Learn and Mike Galbraith, CFO, Thalmic Labs will be the speakers for the event. This is a great opportunity for students to connect with industry leaders and learn how to make an impact in exciting and growing industry!